New seismic data provide structural basis for strong earthquakes that strike at both ends of the Pacific Northwest fault zone. With four years of data from 268 seismometers on the ocean floor and several hundred on land, researchers have found anomalies in the upper mantle below both ends of the Cascadia Subduction Zone. They may influence the location, frequency and strength of earthquake events along the U.S. Pacific Northwest. The anomalies – discovered under the southern Gorda deformation zone at the north edge of the San Andreas Fault and under the Olympic Peninsula and southern Vancouver Island – point to pieces of the Earth’s upper mantle that are rising and buoyant because of melting rock and possibly elevated temperatures. The anomalies, which reflect regions with lower seismic wave velocities than elsewhere beneath the fault line, point to pieces of the Earth’s upper mantle that are rising and buoyant because of melting rock and possibly elevated temperatures, said Miles Bodmer, a University of Oregon doctoral student who led a study now online as an accepted paper by the journal Geophysical Research Letters. The 620-mile subduction zone, which hasn’t experienced a massive lengthwise earthquake since 1700, is where the Juan de Fuca ocean plate dips under the North American continental plate. The fault zone stretches just offshore from northern Vancouver Island to Cape Mendocino in northern California. The mantle is rising under the southern Gorda deformation zone at the north edge of the San Andreas Fault and under the Olympic Peninsula and southern Vancouver Island. Locking refers to how strongly two plates stick. “If they are stuck together tightly, as is the case here, they are building up stress, and you have the potential for the release of that stress, or energy, in large earthquake events,” Bodmer said. 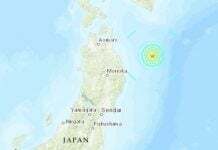 Such quakes, while strong, are below that of the 9-plus magnitude event projected should all of Cascadia rupture at once, he said. 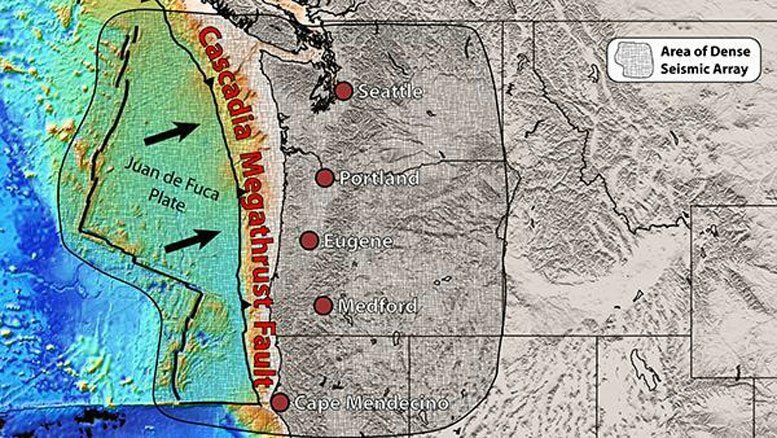 Locking is much weaker in Cascadia’s central section, which includes most of Oregon, where infrequent, smaller quakes tend to occur from creeping along the plates. Tremor refers to long-duration seismic signals often seen at subduction zones. “These happen deep and take more time than a typical earthquake as they rumble to release energy,” Bodmer said. The findings won’t help earthquake forecasting, but they do point to the need for real time onshore-offshore seismic monitoring and geodetic analyses, such as from GPS to help plot spatial coordinates, of the anomalies as a next step in that direction, said co-author Douglas R. Toomey, a seismologist in the UO Department of Earth Sciences. The study helps to make sense of Cascadia’s historical record of earthquake, he said. The junction of the Cascadia-San Andreas faults, Toomey said, contains a lot of complexity and is the most seismically active part of contiguous North America. Seismic history also shows more earthquake activity in the Puget Sound area than in central Oregon. 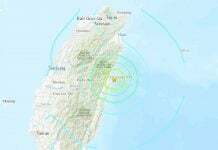 Both regions accumulate energy that eventually is released in large earthquakes, he said. The study involved deep imaging, similar to CAT scans, using different forms of seismic waves coming from distant earthquakes moving through the Earth. The ocean-bottom seismic stations, from which data were retrieved every 10 months, were part of the National Science Foundation-funded Cascadia Initiative. Older data from numerous onshore studies in the western United States also were included in the analysis. In addition to helping to understand Cascadia’s historical earthquake record, the anomalies, Bodmer said, suggest that the two buoyant ends help to modulate plate coupling forces. 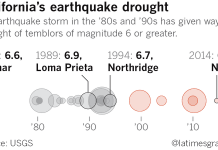 California is in an exceptional earthquake drought. The question is when will it end?